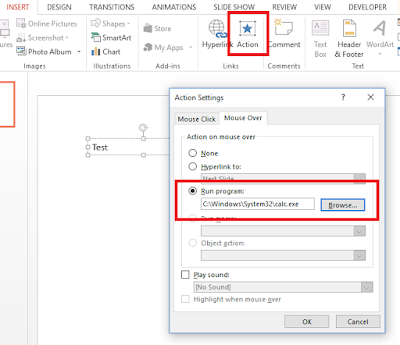 There are a few different ways payloads can be delivered through Microsoft Office documents, including macros, OLE embedding, Addins, Actions and DDE. To make life easier I wanted to list them all together in one place. A lot of what is mentioned below is specific to Word, Excel or Powerpoint however don't forget that Office actually includes, Word, Excel, Powerpoint, Access, Outlook and OneNote. If a vector doesn't work in one product, try another. When testing any of the below remember that Office may require basic user interaction to either "Enable Editing" for documents from the internet or "Enable Content" for active content. Macros are probably the most well-known method for abusing Office documents. Essentially Office allows users to include VBScript to add dynamic functionality however there are no restrictions on this functionality. Simple payloads will execute a single process e.g. powershell, more advanced payloads will load WinAPI functions to inject code into memory without ever launching additional processes. So how do you get your VBScript to load? 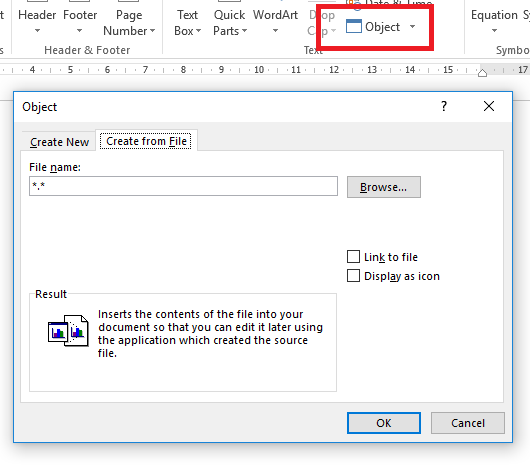 Well Word provides two useful functions AutoOpen() and Document_Open() that can be used to automatically launch a payload when a document is opened. These functions will work in .doc .docm and dotm, but not docx. Instead of embedding the payload directly in the current document you can also use templates/addins. So although the current document may not contain anything malicious if the template/addin does then it will still execute. Aside from the standard macro launching functions (AutoOpen etc. ), Word/Excel/Powerpoint also support ActiveX "Controls" and "Fields" which can be used to either automatically launch macros or trick users into executing macros. Basic options include buttons and images, more exotic options include frames and the built-in Microsoft browser. The "Fields" function in Word (Insert -> QuickParts -> Field) is another interesting vector, in particular the Link and MacroButton functions offer ways to embed/activate content. After Macros the next most interesting Office feature is probably OLE embedding. By default Office allows users to embed external content in documents. This can be used to insert pictures, videos or other documents within the current document. What's awesome is that you can also just insert a binary or a malicious script. This works across Word, Excel and Powerpoint. All the user has to do is double click the embedded content and you get a shell. Powerpoint is obviously designed for presentations and most people are familiar with transitions, (making memes fly in and out). 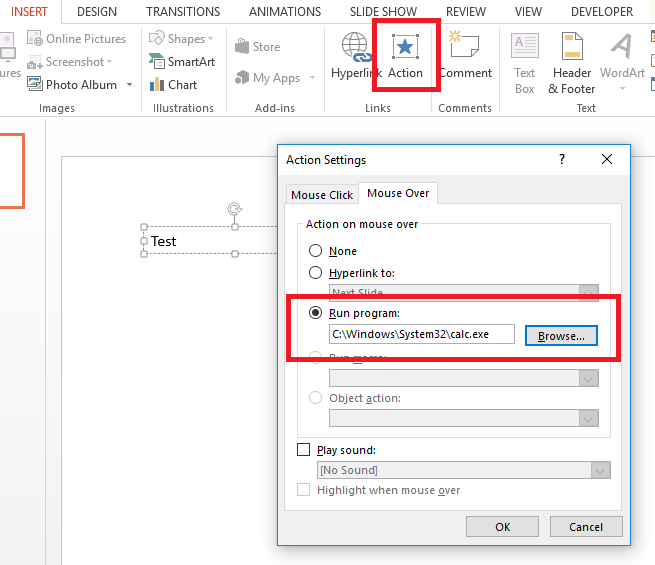 But what you may not know is that Powerpoint supports OnClick and OnMouseOver "Actions". What are actions? Well anything you like, they basically allow you to execute a process of your choosing including arguments. The one limitation with this vector is that the user needs to view the slides in presentation mode, so you'll need to add some text telling the user to press F5. DDE (dynamic data exchange) is a semi-legacy Windows feature used for displaying data from external data sources in your current document. Sounds reasonable enough right? Well the issue with this functionality is that it allows you to not just call external documents but also processes and you can supply command line arguments too. So another very hackable feature. Remember that as well as =, Excel also supports the use of + - @ characters at the start of a formula. It's worth mentioning that I couldn't find a way to execute DDE in Word or Powerpoint. I'd be interested to know if this is possible or not. Many companies/products will filter content based on either the extension or content-type of a file. Lucky for us Office has many different formats that will modify the appearance of our payload but not the action of the payload. To experiment with such bypasses take a look at the "Save As" supported formats. In Word/Excel/Powerpoint you'll see there are many different output formats. 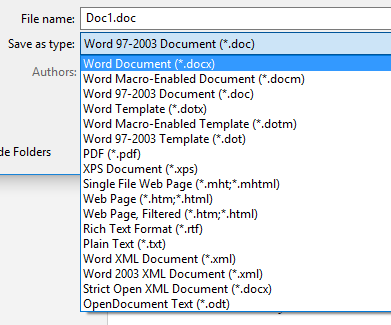 You can use the different formats on their own or try renaming the extension back to doc/ppt/xls. In most instances the payload will still execute despite having the content modified. The "Fields" as well as the "Data Source/DB" feature in Word have multiple potentially interesting functions. I couldn't find a way to exploit them, maybe you can? In Office hyperlinks are quite interesting as they let you link to local files however you can't supply arguments. It would be interesting to see if args could be supplied somehow or links abused in another way. Microsoft Office provides multiple different ways to execute code. There are still quite a few features that I feel could be exploited with more research and given how commonly used Office documents are for payload delivery I can imagine we'll see more vectors in the future. I didn't mention prevention/detection above but from a defensive point ideally you want to block any email attachments containing a Macro or OLE. For detection it's relatively easy to spot suspicious child processes (cmd/powershell/wscript etc.) coming from Office, direct to WinAPI stuff is more complex to detect but not impossible with the right tools. Hope you guys have found this useful, if I missed anything obvious out let me know in the comments below. In this post I'm going to explain how to write a simple NaiveBayes text classifier in Python and provide some example code. My original goal was to tell the difference between regular dictionary words and random strings. I looked at using manual ngram frequency analysis and this partially worked but I wanted to try out an ML solution for comparison. I don't have much ML experience but it was easy to build a working script using the scikit library. This library abstracts away much of the mathematical complexity and offers a quick and high level way to implement ML concepts. In just a few lines of python I was able to build a classifier with 93% accuracy. It's worth mentioning I did not use the "bag of words" approach as I was looking at analysing the structure of individual words as opposed to sentences. Changing the CountVectorizer parameters you could look at sentences or groups of words. In each file I used the first 5000 words for training and the last 5000 for testing. To vectorize the words I used the CountVectorizer with the ngram function, this breaks the words up based on their ngrams and converts them to numbers. With the data ready I used the "fit" function to train the classifier with the training data set. To measure the accuracy of the model I used the "score" function and test data set. And finally to manually test some values I used the "predict" function. In the end my classifier could function with a 93% accuracy which I thought was pretty good considering I made hardly any customisations. I used the Multinomial Naive Bayes function as this was recommended however other algorithms may work more effectively. The classifier and vectorizer also support a number of additional parameters that can be adjusted to improve the accuracy, I modified them only slightly, further improvements could likely be made here as well. The following requires Python 2.7, scikit, pandas and also the two csv files containing data as described above. If you're trying to install scikit in windows you'll need to install the relevant .whl package. In Linux I had to upgrade pip before it would install. I was amazed how quick and easy it was to write a simple classifier, machine learning has definitely gone mainstream. I focused on finding the difference between normal and random strings however classifiers can be used to tell the difference between all kinds of data sets. Hope you guys have found this useful, any questions or comments, leave a message below. Love mimikatz but hate the output? Yeah me too. In this post I'll show you how to parse the output with one simple line. I start by outputting all files in the current directory and removing carriage return characters as these seemed to break awk. I also remove tab characters to clean up the output. Next up I used awk to effectively put the username, domain and password all on the same line. This makes greppping, cutting or more awking easier. I used grep to remove lines I didn't care about. For example NTLM hashes and null passwords. And finally I sorted and uniqued the list. If you want a different output format just modify the final print statement. Mimikatz is such an awesome tool unfortunately the default output is not that user/grep friendly. Luckily with a simple one-liner we can easily work the output into something more useful. As mentioned in my smb-share enumeration post, don't be afraid to jump in and learn some grep/awk/sed, these tools can speed up data analysis massively! Hopefully this post has been useful, if you have any suggestions for improvements or better ways to get usable output then leave a comment below. In this post I'll look at which Content-Types and Extensions can actually be used for XSS in modern browsers. Why does Content-Type and Extension matter? Applications come in many different shapes and sizes and XSS can occur all over the place. It's easy to assume that just because an application returns you a response with unfiltered/unencoded output you've found an exploitable XSS issue but this is often not the case. Browsers render content based on a number of factors including content-type returned by the server, page content and page extension, without the correct combination XSS won't be possible. In the first test I forced the server to return the correct extension and content-type for each test page. In the second test I made the server return the correct content-type but forced a .html extension. This test seemed to show that browsers will prioritize the use of the content-type over the extension. In the third test I used the correct extension for each file but made the server return a text/html content-type. It looks like browsers rely heavily on the content-type returned by the server. It doesn't matter about the extension or contents of the file, the browser will blindly follow the content-type returned. Next I used the correct extension for each file but made the server return a text/plain content-type. When using a content-type of text/plain none of the payloads executed. I can't remember for sure, but I believe in the past text/plain used to allow XSS? Looks like this is no longer possible. In this last test case I accessed a page that had no extension and received no content-type header from the server. This should have caused the browser to fall back on mime sniffing to render the page. Both Chrome and Firefox refused to render pages that contained additional non-html content. IE however didn't seem to care what the page content was, if it contained HTML it rendered! Performing application testing on a regular basis I find content-type and extension XSS issues arise quite a lot. This test showed that modern browsers are relatively secure as long as the correct content-type is returned. All browsers also seemed to implement the same analysis techniques aside from IE which seemed slightly more permissive. In this post I'll explain how to get past Sky's Broadband Shield website block. I recently tried to load xvideos.com and was redirected to a page at "http://block.nb.sky.com". Without the credentials for the Sky user account I was unable to login and switch off the Sky Broadband Shield as suggested. Curious how Sky were performing such a redirection I checked the DNS records. I discovered that the Sky DNS record for xvideos.com had been modified to point to the Sky block site (90.207.238.183). Lucky for us this is easy to bypass by using an alternative DNS server. Time To Modify Your DNS Settings! 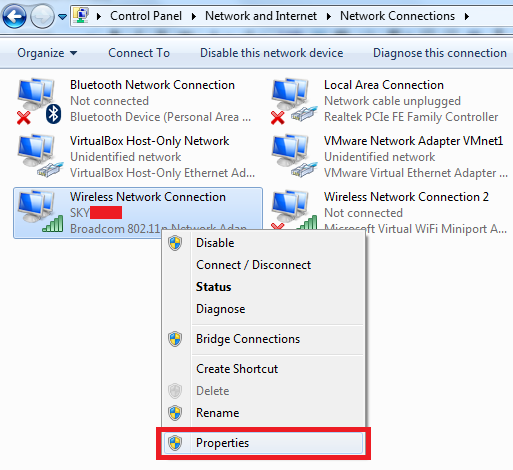 By default your home router will retrieve DNS settings from Sky and your local machine will retrieve DNS settings from the router. By modifying either the DNS settings on the router or on the local machine to point to a different DNS server we can retrieve the real DNS record and bypass the block. 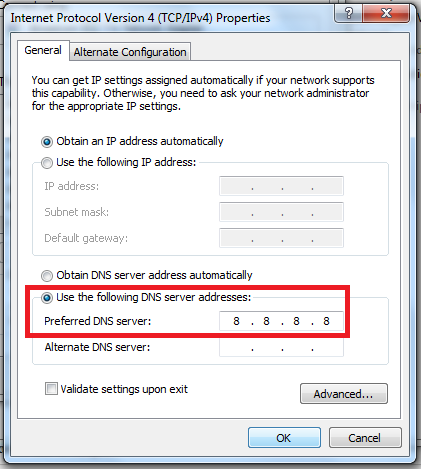 Next modify the DNS settings to use Google's DNS instead of Sky's DNS server. Once the settings have been saved when querying the DNS for a blocked site you should now get the correct ip's returned. It's also worth mentioning that if Sky had chosen to use ip based filtering this could have been bypassed using a proxy or VPN. Although do remember that the operators of such services can potentially view and modify your traffic! Thanks for reading. Questions or comments, just leave a message below! I'm going to be taking the CREST CRT exam in January and wanted to share my preparation notes with the world to save everyone else the time and effort of digging up this information to pass the exam. Note: I have not taken the exam yet, I do not know the answers and am in no way affiliated with CREST. What have we gota do? To quote the official documentation - "The Certification Examination has two components: a multiple choice written question section and a practical assessment which is also examined using multiple choice answers. The practical assessment tests candidates’ hands-on penetration testing methodology and skills against reference networks, hosts and applications." For the "written question" section I'd recommend Wikipedia or some SANS/CEH material. For the practical side of things see below. Displays the full information about your NIC’s. Displays your local DNS cache. 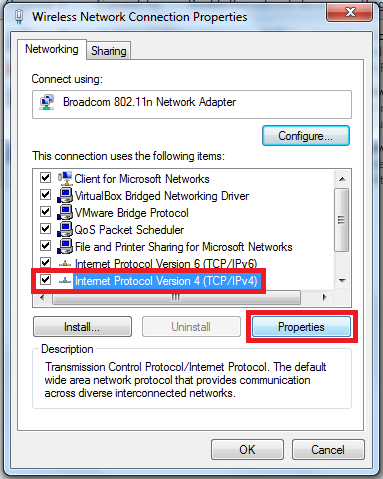 The “b” flag makes the command take longer but will output the process name using each of the connections. Queries NBNS/SMB (SAMBA) and tries to find all hosts in your current workgroup or domain. Prints the password policy for the local system. This can be different and superseded by the domain policy. Lists all the systems currently in the machine’s ARP table. Shares the C drive (you can specify any drive) out as a Windows share and grants the user ‘hacker’ full rights to access, or modify anything on that drive. Changes an inactive / disabled account to active. This can useful for re-enabling old domain admins to use, but still puts up a red flag if those accounts are being watched. wmic useraccount get name,sid - Retrieve name and sid from command line. In a nutshell the JS appends a new <script> element to the <head> element. The user is able to modify the country part of the script element as this is retrieved from the URL parameter "c". So how can we exploit this? In terms of regular inline XSS there are two potential injection points, either directly in the JS or within the HTML output. In this instance neither work because of the way the input is handled and encoding. But we still have no way to load our own JS...or do we? From Traversal to Dead End? The easiest way to get JS execution from the traversal would have been to locate an upload feature or error message on the same domain that allowed the user to control the first few bytes of the response. This would have allowed the inclusion of a JS payload that could have been accessed through the traversal. Unfortunately I couldn't find such a place....but I did have an open redirection I could play with. Open redirection is often classed as medium/low risk but in this instance it was the final piece of the XSS puzzle as it would allow us to redirect a browser offsite to grab remote JS. Congratulations you've achieved XSS by loading remote JS from traversal and redirection! I definitely think this functionality could have been handled in a cleaner way using server-side code. A quick fix though would have been to whitelist the country parameter to prevent path traversal. If you have any questions or feedback just drop me a comment below. Pwndizzle out.